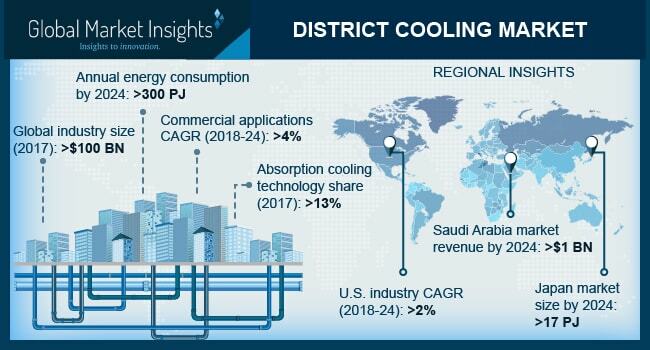 District Cooling Market size will exceed USD 140 billion by 2024, as reported in the latest study by Global Market Insights, Inc. Growing concerns pertaining to carbon emissions along with rising demand for space cooling will foster the district cooling market. Increasing penetration of renewable energy technologies coupled with growing adoption of sustainable cooling solutions will stimulate the industry growth. In 2016, Tabreed reported an elimination of 570,000 tons of CO2 emissions from there 66 DC plants installed across the GCC countries. Changing climatic conditions on account of increasing surface temperature and global warming will boost the market share. In addition, rapid urban area development and growing residential sector owing to increase in consumer spending and rise in per capita income will encourage the product adoption. The average temperature in Kuwait during summer seasons was recoded to be 300 C in 2016. Japan district cooling market is set to exceed 17 PJ by 2024. Rapid economic growth coupled with strict environmental norms toward emissions will encourage the product adoption. Growing concerns toward energy security along with large scale deployment of cooling systems across Tokyo, Sapporo, Osaka and Yokohama will complement the business outlook. Rapid technological advancement in product design and development along with extensive R&D activities across the nation has also instituted favorable business scenario for the industry players. Increasing adoption of energy efficient and sustainable building standards along with ongoing development of environment friendly building solutions will stimulate the commercial market. In addition, the flourishing service sector including office buildings, data centers, colleges and universities will further impact the industry growth. For instance, in 4th quarter 2016, the overall investments toward commercial establishments were valued around USD 107.8 billion. Ongoing adoption of heat pumps owing to their compatibility with sustainable heating technologies will stimulate the district cooling market. In addition, the technology is widely used for trigeneration, providing heat, cool and electricity across the commercial and residential establishments. It uses the waste heat to generate energy thereby, reducing the emissions effectively when compared with other counterparts. Stringent regulatory framework toward the adoption of sustainable cooling technologies along with accelerating service sector across the nation will boost the Sweden market. Increasing investments toward development of innovative energy efficiency solutions, energy management systems and efficient pipeline network will encourage the product demand. Ongoing deployment of clean energy technologies on account of government norms toward decarbonization of buildings will further complement the business outlook. Key players catering across the district cooling market includes Keppel Dhcs, Tabreed, Singapore District Cooling, Emicool, SNC Lavalin, Fortum, ADC Energy, Vattenfall, Sellar Energy, Veolia, Shinryo Corporation, Ramboll, Qatar Cool, Siemens, Empower, Engie, Logstor, Alfa Laval, Wien Energi, Helen and Goteborg Energi.